French Connection launched their homewear range this week. With clean minimal lines, a modern-rustic-meets-industrial vibe and a focus on natural materials such as wood and linen there is lots to covet. I particularly liked the safari style chairs, the industrial anglepoise lamps and the blue and white tableware. Tied edges add a subtle twist to this marl cotton jersey bed linen. Above left: Rustic hanging pendant light. 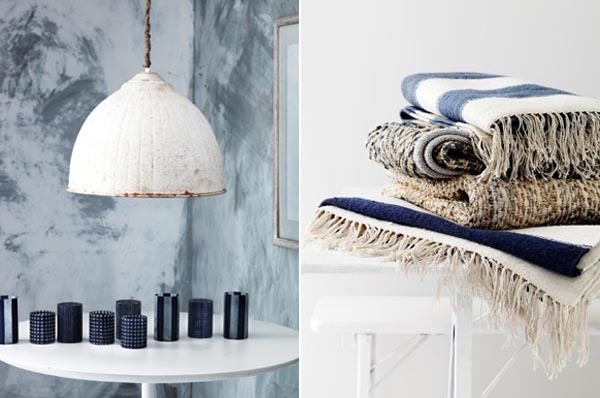 Above right: Jute and leather rugs. All in all its very well considered. As someone who's not usually interested in 'buying a look' straight from the high street I have to say I loved it.